As summer fades, NY-History considers the power of ice cream to unite New Yorkers of all stripes. When I was a kid, summer meant I could always get away with a little more. I could stay out a little later or watch TV a little longer. But the best part was there was always a way to convince my parents ice cream was a good idea. What’s the point of all this hot weather if you can’t cool yourself down with frozen treat? And considering it’s past Labor Day but still 90 degrees out, I think we can extend summer ice-cream season a little bit longer. Ice cream is a dessert for the people. For many New Yorkers, ice cream was a street food sold out of carts. 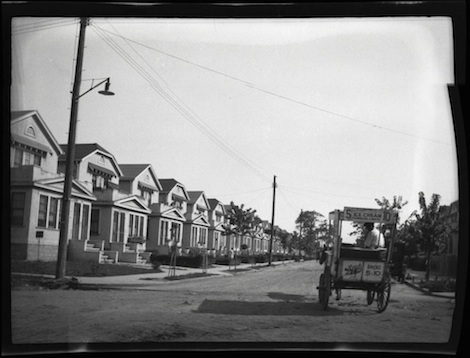 For others, soda shops provided a sit-down environment to enjoy sundaes and other desserts. People also made it in their homes, and probably had more luck than I did when I attempted it. The rich had much fancier ways of presenting ice cream. 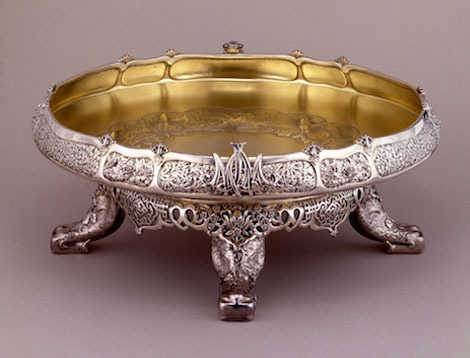 The silver ice cream dish below was part of an extravagant 1,250-piece dinner service made by Tiffany & Co. for John W. and Marie Louise Mackay. In 1873, “Silver King” John Mackay had the service made from half a ton of silver extracted from is mine in Virginia City, NV. It was the largest and most ornate service of the Gilded Age. Reportedly, two hundred craftsmen worked on the service exclusively for two years. But whether you enjoy it from a truck or off a silver platter, it’s definitely still time for ice cream. How do you like yours?